I’ve been debating whether Predators deserves a full review. I try to review films only when I have some point to make about them, and I wasn’t sure I did with Predators. 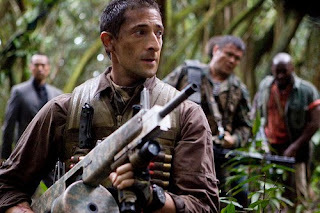 But the more I thought about it, the more I saw something worth discussing: Predators is a great action flick because it goes back to the old-school way action films were made, which is something we haven’t seen in years. Since the 1980s, action films have been made according to formulas. Their highs and lows are generically scripted and the details get filled in according to the type of action hero choosen: muscle men, martial artists, hot chicks or street-wise tough guys. Plots are little more than MacGuffins, and each story includes a standard set of required situations: the capture, the escape, the betrayal, the showdown and the fake first death. All the while, CGI explosions cover the screen to distract you from the crappy story. Predators disdains that formula and acts more like an old-school action film, where the actors have to pull you in, where the story is interesting in and of itself, and where the “action” derives from the actions of the characters rather than the CGI explosions. 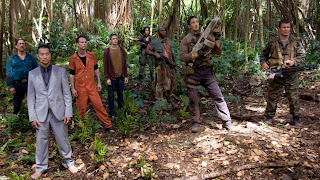 Predators is a sequel of sorts to Predator and its progeny, though it barely mentions those. The story opens with Adrien Brody being parachuted into a jungle. In the jungle, he meets seven other people. They are all killers. For example, Alice Braga is an Israeli Defense Force sniper, Walter Goggins is a murderer on death row, and Louis Ozawa Changchien is a Yakuza enforcer. The only one out of place is Topher Grace, who is a doctor. It doesn’t take long for them to realize they are on an alien planet and they’ve been brought here to be hunted. 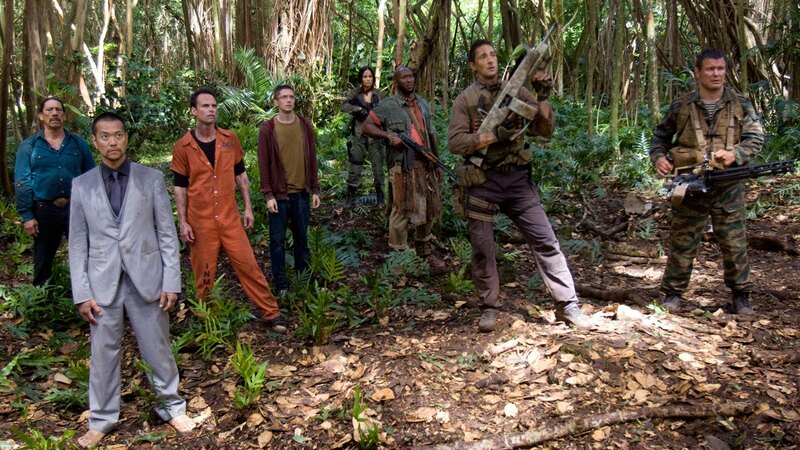 The rest of the movie involves these characters struggling to defend themselves against the predators. There is even an excellent cameo. 1. Death to CGI! The scenery is excellent because it's real, i.e. it's not CGI. The monsters are excellent and real. The action feels authentic. At no point does this film wander off into CGI cartoon land. In fact, you leave the film wondering if they even used CGI. And the benefits of this are huge because it gives this film a solid connection to the real world. 2. The Plot. While I like films like Commando and The Transporter, the truth is they have no plots. They offer just enough conflict to justify the action and no more. Predators actually relies on its plot. In fact, there is surprisingly little action in the film and most of it comes later in the film -- it takes almost an hour before you even see the predators for the first time. In the meantime, the characters try to solve the mystery of where they are and why they are here. This is very reminiscent of old-school action films where the action was considered a climax to the plot rather than a plot-substitute. And even though the plot is largely obvious, it's still sufficiently unpredictable from moment to moment that it keeps your interest. 3. The Writing. Everything about this film feels authentic. It's entirely believable that this group of people would be chosen and it's entirely believable these people could put up a tough fight against the predators. They react as one would expect given who each of them is, e.g. they aren't all the bland modern self-sacrificing reluctant hero. The way they behave is believable. Their dialog not only suits them perfectly, but is tailored to each character, i.e. they talk like what they are. Even the humor is believable as there are no comic relief characters and the plot is never compromised to set up a joke -- the jokes derive from things you actually expect these characters to say and they are used to break the tension, but without becoming comedic. Moreover, it's so well written that it's full of lines that make you think "that's the best line in this film" over and over again. 4. Adrien Brody. Finally, the most impressive thing about this film is Adrien Brody. I could say "the acting" because they're all good, especially Grace and Goggins, but the guy who carries the film is Brody. Interestingly, while I’ve come to respect Brody’s acting ability in films like The Village and The Jacket, I had serious doubts he could pull off an action hero. But pull it off he does. He plays an American mercenary with a black ops background, and he plays the role perfectly. He speaks quietly and authoritatively and has a commanding presence. He moves smoothly and ruthlessly. He never acts stupidly or arrogantly and he never forgets his experience just to move the plot. All in all, watching him is like watching a special ops team on the Discovery Channel. I simply can’t say enough good things about the job he does. This is why Predators succeeds so well and why it made $120 million. It’s smart, tense and it keeps your interest for reasons other than big shiny things blowing up. It’s the first action film in a long time where you don’t know who will live or what comes next. It also avoids all of the clichéd scenes that now make action films so lame, i.e. there's no moment where we discover that our government is secretly behind this, no double cross by the hero’s lifelong buddy, and no scene where the hero surrenders to save a puppy. There is just a highly believable story with engaging characters. And that's a heck of a lot more than we get out of most action films these days. Hmmm. Interesting. I wasn't actually concerned about seeing this movie; it just seemed in the trailers like a rehash of the older movies, but now I'm intrigued. I might have to check it out. And yeah, who knew Adrien Brody could be an action star? T_Rav, That's the other reason I thought this deserved a review. The last two films in particular were awful and forgettable. So when I saw this, I wasn't expecting much more than another crappy addition to a dying franchise. But it really was not what I expected. It was a very solid action movie that kept my eyes on the screen the whole time (which is getting a lot more rare for me these days) and never lost me for a second. In fact, it just keeps getting better and better throughout because it keeps offering little surprises that I haven't mentioned -- like the cameo and the relationship of the aliens (which I don't need to go into and so won't). If this had been the first film in the series, people would be raving about it. The only thing holding it back was the idea of "oh yeah, another one of those." On Brody, I was stunned. He's always struck me as a thin, weak, nerdly kind of guy. But he really comes through in this. He comes across like the real version of the characters that Arnold and Stallone only play at. By the way, on the one-liners -- the film is full of them, but they feel completely natural. In Arnold films, you get things like "stick around" -- puns. Q: And what does that make you?" And when you hear it, you're thinking, "wow, awesome line." It's the same with the humor. Grace has the best humor, but none of it is said in a humorous way. It's more things like 2-4 word sentences that just highlight a moment of frustration and that literally make you laugh out loud as tension relievers. Andrew: I thought Brody did a pretty good job of being an action character in King Kong, and I think he's an all-around very good actor. With that nose, he has to be. So I'm glad you did this review, because I was bored silly with the Predator followups, and had no intention of watching this one. Now I will. You also spurred me on by mentioning the lack of CGI. I'm just plain sick of CGI and battle scenes with more CGI warriors than there are people in the entire world. Lawhawk, You know my position on CGI, so I was thrilled with the lack of CGI. There is some, but it's really not noticeable -- it enhances. And that makes this whole film seem so much more real than anything I've seen lately. In fact, there are no wire fights either. It's like a good old fashioned film with real stunts and real sets -- and that makes it so easy to see this as a real world and these people stuck in it. Brody was good in King Kong, that's true, but this one still surprised me. I just never saw him being capable of playing "the tough guy." He easily gives any of the recent action heroes a run for their money. I was very, very impressed. Andrew: In 1999, Brody did a little-seen movie called Oxygen. He proved his acting chops for me with that one. He was evil, devious, nasty and convincing. Basically, he played an action character, but he was definitely not the good guy. By the end of the movie, he had me hating him. Lawhawk, I saw that and I agree -- he was excellent. I liked him a lot in The Jacket too, even though I didn't care for the movie. And I thought he was excellent in The Village. I'm looking forward to him getting more parts in the future. Andrew, I saw this and I really liked it. Like you, I was impressed with Brody a lot and I was surprised this was as good as it was because I was expecting more like the last film. I know you don't want to discuss too many of the "little surprises," but what do you make the relationship between the two aliens? I've debated that with some people. There are two different types of predators. It seems to me that the smaller ones are the ones that came to earth in the first two films, i.e. the ones that Arnold faced. The larger ones are the post Alien v. Predator predators after the aliens embedded themselves in the predators. It strikes me that the predator that got infected made it home and must have infected his planet. When the new alien/predator hybrid bred -- like they did with Weaver in Alien Resurrection -- those became the new dominate predators and they started using the old ones as game. That's why there is the difference in appearance as the big one is clearly a hybrid. I thought it was pretty clear, but a lot of people seem not to have caught onto this. Or I guess there could just be two types? Andrew, I thought about that, but wasn't sure because their blood wasn't acid, which seems to be the key feature of all the aliens. That's why I fugued they were just difference "races" of predators,. Ed, That's a possible explanation and admittedly, if these are hybrids, then they are very different than prior versions. But it makes sense to me based on the difference in how they look. Plus, there's no evidence that the one who came to earth in the first couple films would do this to their own kind -- they seemed rather sporting in fact... almost honorable in who they would or would not kill. That's inconsistent with the idea that they are now hunting their own. Crispy, I liked The Village though I thought it could have been better if he's stuck with either horror or romance, but not both. Andrew, What's you favorite recent action film other than this one? DUQ, Difficult question. I guess it depends on how recently we are talking. I actually enjoyed The A Team a good deal. I didn't care for The Expendables. Before that, it would probably be Pitch Black? I'd really have to think about it if there was something in between. I like a lot of the actors, like Jason Stathem and Vin Diesel, but I can't think of a particular movie of theirs that would be the one. Beyond that it gets tougher. It's been a few months but I thought this film was quite generic. It was okay - about on par with AvP but miles ahead of AvP: Requiem - but at times I felt the film could've used any race of alien creatures and the results would've been the same. I don't think it contributed to the Predator "mythology" the same way the Alien sequels did to that mythology. I did like Brody, though. I feel bad for him, considering some of the articles I read that laid the blame for the death of the modern action hero on casting decisions like this one (and guess where I read that!). Scott, Hmmm. Ok, let me put this delicately. I am not surprised that some people would be upset at the casting choice. There is a segment of society that is retarded and simply cannot see the world except in ultra-exaggerated, cartoony, black and white ways. These people need big muscle men to play the tough guys and silicon enhanced barbies to play the female characters or they find themselves in an uncomfortable land where the roles aren't sufficiently obvious to fit into stereotypes... hence, causing them to have to turn on their brains, which is a painful and useless experience. It makes them happy to stay in cartoon land where everything is obvious and magnified so large and so black and white that you can't possibly miss it unless they've literally just taken a bullet to the head. I hope that wasn't too harsh? ;-) But the lesson is to take ANYTHING these people say with a grain of salt because their analysis is about as shallow as your average high schooler's. If these people had their way, none of the great actors they now profess to love would have had jobs -- Bogart was a small man with a lisp, Charles Bronson was a little fat guy, etc. etc. In terms of being bland, I disagree, but that's a matter of opinion. What this film "lacked" in big shiny explosions, it more than made up for in strong characters and solid acting. In terms of advancing the story line, I think you've missed the point. First, this film wasn't about adding to the pretty sorry legacy of Predator. The last two films in particular were pathetic and this film was an attempt (like Casino Royal) to get back to the roots and then some of the original concept. Thus, trying to build in the last couple silly films would have been counter productive. Secondly, as I mention to Ed above, I think it made a huge addition to the mythology as it explains what happens after the infected alien gets home after the third film -- they break into two races and the predators are overcome by the predator/alien hybrids. Finally, after all the hype, I was really disappointed in The Expendables. It had no plot, the characters were less than interesting, and the action was all smoke and mirrors. I never once felt there was the slightest hint of danger. I saw "A-Team" last year, and as someone too young to have caught the original during its run and get what the fuss is about, I liked it pretty well. I do understand that there is no replacing Mr. T, of course; but it did a good job. Also, regarding alien/action movies in general, I was watching "Cloverfield" not too long ago. Thoughts (beyond the bloody shaky cam business)? T_Rav, I didn't compare The A-Team to the series because there's no comparison. The series was a kids show that followed a very simple television formula and had some fun moments -- I watched it religiously at the time, but it doesn't hold up to the test of time. It's just too primitive to still be enjoyed. The film was like a stylized version that barely made reference to the series. So I never saw them as comparable except in the loosest sense. Thus, I judged it as an action flick rather than a remake and I enjoyed it. It was stupid, incredibly unbelievable (in every single respect) and fairly cliched. But it was fun. I wouldn't give it an award and I wouldn't want to see it again, but it was worth a couple hours one time. Cloverfield.... this one breaks my heart. I thought the movie was genius and was so well done that it would have ranked up there as one of the great sci-fi/horror/disaster films. BUT... the shaky cam was so utterly horrible that I rank it as one of the worst movie experiences I've ever had. They took a potentially great film and made it unwatchable. T-Rav, What did you think? Eh, I kinda liked it. I didn't see it in theaters, in which case my experience and evaluation might have been a LITTLE different; but I honestly didn't have that much of a problem with the shaky cam thing. I don't like it at all, I think it's a bad idea 98% of the time, but at least "Cloverfield" had a generally plausible explanation for it. Let's see, what else...I also liked the fact that the alien/creature/whatever it is was never clearly pictured, or given any kind of backstory; that was a nice touch. Also, I thought it was very realistic as a depiction of contemporary youth culture--for example, you just know that if such a thing were to go rampaging through Manhattan, a bunch of twenty-something idiots would immediately stop and begin recording it on their cell phones rather than run away sensibly. So, yeah, I guess I enjoyed it. It's not among my favorite sci-fi/horror movies by any means, but if you can look past the camera distractions, it's not bad at all. T-Rav, I can take the shaky cam in small doses IF it has a plot-caused point (like Cloverfield), but not when it's the director looking for a way to hide his inability to direct an action scene. And certainly not for very long. Short doses is something like 20-30 seconds tops. Cloverfield got to the point that I literally stopped watching and just listened to it. One of the people I was watching it with walked out. I think they ruined what could have been a great film. Indeed, I agree that this is the first movie to accurately capture how modern people would respond -- with whipping out cameras and heading toward the monster. That was something I thought really set the film apart, plus the way they presented the monster (or didn't) and the way they teased you with only glimpses of what is happening. Plus, I thought the evacuation was ingenious the way they went through the subway and a department store. That seemed very realistic. But, because of the shaky cam, I absolutely resented the presentation and I won't watch it again or ever recommend it. Not harsh at all! Though I realize I should probably stop with my veiled criticisms of BH since it's obvious nothing is going to change on that front. I suppose I simply wished for Predators to be on a somewhat grander scale. I realize this wasn't the filmmakers' intention but, at the same time, it would be like someone trying to reboot the Alien franchise by simply making another "alien killing people on a ship" movie, with perhaps a slightly modified alien creature. I think it may be an expectations thing. If you went in expecting "the next chapter" then would be disappointed because it really was a reboot more than another chapter -- and it was a "back to its roots" reboot like Casino Royal. But if you just watch it as a "film" film, it's really an excellent action film. As I said above, if this had been the first movie in the series, people would have been raving about it. But since they expected it to be "the next chapter" people like you were disappointed and people like T_Rav and Lawhawk skipped it. Also, keep in mind that action films are rarely "great" films, even when they're really well done. In fact, there are only a handful of action films that I would say are great and stand apart. Most of the rest are either pass/not pass. On BH, I don't think things will change. I sent you an e-mail about this. On the Cloverfield effects, there was a video on line about a year ago. I can't remember the name. It was something like "Attack on (South American city)." It had really incredible effects -- better than anything out of Hollywood in years. And it was supposedly made for $400. Hollywood is not getting good value for the money. They are using cartoony CGI, they are pushing it beyond it's limits, and they are relying on it too much. If filmmakers cared about their craft, they would go back to models and to story telling. But then, they don't really care -- they care about reaching the lowest common denominator market.... which is another reason we should be praising films like Predators that disdain CGI battles. I liked this one a lot. Brody is convincing as a spec ops guy. Most of those guys ain't huge and muscle bound because it's all about the conditioning, endurance and, of course, they have the confidence to know they can go past any sort of mental barriers that we naturally (and unnaturally) impose upon ourselves both physically and mentally. Most hollywood directors and actors like to portray spec ops guys as swaggering, extremely aggressive (when they don't hafta be), unnecessary risk takers, not too bright thrill-seeking yahoos. So it's refreshing to see a realistic portrayal by Brody. He obviously did some research for the role. That's an interesting theory about the bigger, more aggressive and less honorable predators. I originally thought they were another race, possibly through eugenics which was extremely popular here (FDR was a big fan) and throughout the world in the 1930's. If Hitler hadn't started WW2 there's a strong possibility that experimentation in eugenics would've spread beyond Germany. Therefor it's easy to imagione other races that might have actually created new races with a "master race" in mind. 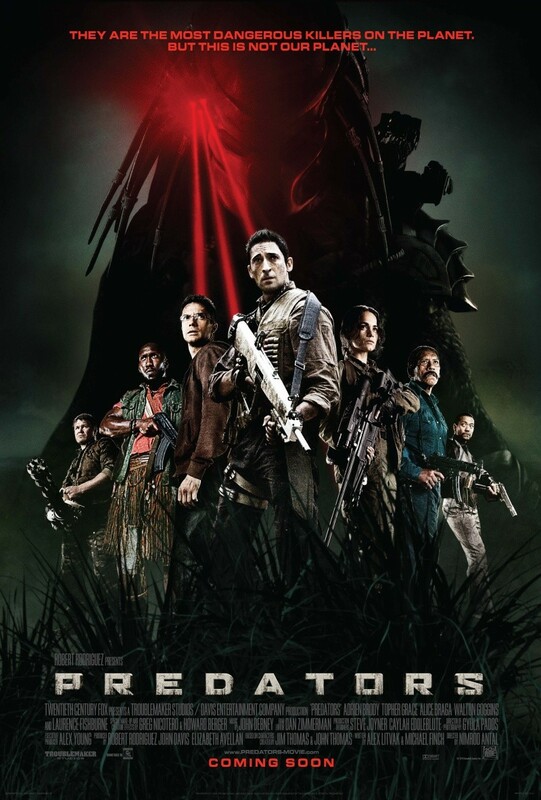 But I like your theory better, and given the lack of clues it makes more sense given the storyline of this flick and the past predator mythos. As for other good and recent action flicks, I liked Red a lot, and The Book Of Eli, as well as Gran Torino. I also thought Wolverine, Iron Man and especially the last 2 Batman flicks was very good. 2004 with Russell Andrews (I really wish they would've kept that guy because he nailed the role). Oh, and Tropic Thunder, but that was more comedy with action/adventure. I laugh just thinking of Downey's brilliant performance, lol! USS Ben, Thanks! I'm glad you agree about Brody. "Refreshing" is the perfect word, by the way -- it was really refreshing to get a hero that I thought was incredibly realistic. And you're right about the spec-ops guys. Everything I've seen about them (and the one or two I've met) look like just ordinary guys. They were incredibly fit, but weren't musclebound like Arnold. And they were very quiet and professional -- very discreet. I thought Brody deserves an incredible amount of praise for how he handled the roll -- he was really impressive. I'm sorry to hear that people attacked his casting. Those are good movie, I forgot about most of them when I was trying to come up with a list. I definitely got a kick out of Red. Downey was brilliant in Tropic Thunder! I'm becoming less of a Ben Stiller fan over time, but that one was really well done and Downey is the guy who made that movie for me! Those were some action flicks I like enough to wanna see more than once and some of those are more than a few years old. Good sction/adventure films are very rare these days. It is nice to see an incresed desire to see more action and less CGI and hopefully we'll see just that. Or, rather, more good action. Ben, I agree -- good action films are rare these days and I think that has to do with the formula they use and the overuse of CGI. The formulas are generic at best and really lack the "fun" element. And the CGI ruins the actions because it becomes like watching a cartoon. I could watch most of the ones you list again, but definitely not nearly as often or as readily as I could watch Commando or Predator or many of the cheesy 1980s actions flicks again. The action flick genre has seriously lost its way. When Stallone was interviewed for The Expendables he seemed to be under the impression that the 80's style action flicks were gonna make a comeback and based on the success of his film I happily agree. While the expendables coulda been a lot better I still found it enjoyable. Hopefully the next one will be better. I think it will be a mistake to make copies of the 80's action films rather than use what worked while still being creative. The Rundown, with the Rock and Sean William Scott did a good job of doing both I think. It was reminiscent of 48 Hours (some parts) but not a copy. USS Ben, I liked The Rundown too. I agree. I think the public would happily embrace a return to parts of the 1980s formula. But not just a copy of the 1980s formula. I think they need to figure out which parts worked and which didn't and then adopt those. For example, I would say that two things worked well in the 1980s -- the "rawness" of the action and the light-heartedness. The action in those films never felt fake even when it looked incredibly fake because it was always about stuns and things we could imagine in the real world. Today, the action is always CGI, highly choreographed wire fights, and shaky-cam. That's hard to see as realistic. It may look cool, but it doesn't feel real. The other thing is the light-hearted feel. Those films were always fun, no matter what was going on. Today, these films take themselves too seriously -- which is something I liked about The A-Team -- they never took it too seriously. I think reintroducing these things into the modern formula would serve them well.